I'm actually looking forward to A Single Man more... Colin Firth, Julianne Moore, Matthew Goode, etc -- the whole cast is top-notch! It looks like a beautiful and moody film -- right up my alley. 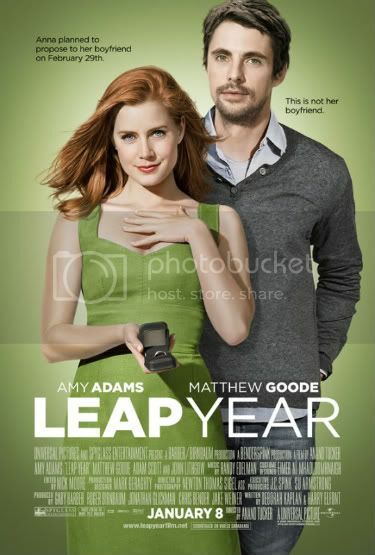 Leap Year looks like every corny rom-com that I've seen before, but we'll probably see more of Matthew in it than in A Single Man. Which is good. Have you seen the poster? It's adorable! Does anyone know when A Single Man comes out? Hmmm how would a movie be limited? does that mean they only play it in the big movie theaters? Sorry I haven't been around in a while! As far as I know, A Single Man's only in limited release in the USA right now. It got released on 12/11/09. Limited means it's not being released in every theater in the US. It's only playing in theaters in LA or NYC. I'm looking forward to seeing it. It looks like a lovely movie. aww! but I don't live in LA or NYC!